During my nine months in Palangkaraya as a Fulbright English Teaching Assistant (ETA), I have learned a lot of different things. I now know that you cannot eat the banana leaves that are sometimes wrapped around your food, and that no matter how many people are in the angkot[i] the driver will always find room for one more. However, the most important lesson that I will take away from this experience is that no matter where you are in the world or who you are, the most vital attributes for success are determination and self-confidence. I think we take this for granted in the United States, but in my experience this is just as true in Indonesia. The person in whom I saw this most clearly is my 2015 WORDS winner, Nabila Fatiha. Nabila giving her presentation at WORDS. Nabila Fatiha is a student in science class XI-4[ii] at SMAN 2 Palangkaraya. This is one of my most exceptional classes, which produced the first and third-place winners for the local WORDS competition, as well several other strong competitors. 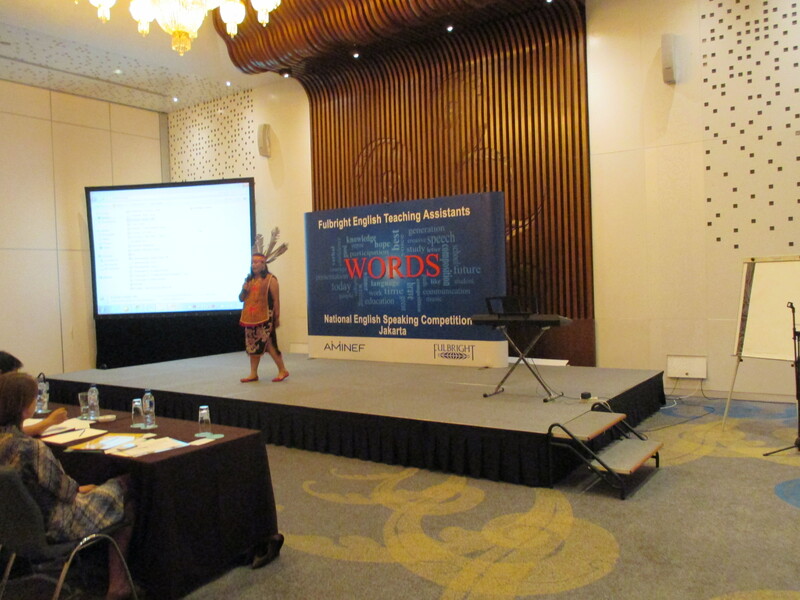 The WORDS Competition is an English language public speaking competition sponsored by AMINEF (American Indonesian Exchange Foundation), the organization that administers Fulbright grants in Indonesia. There are thirty-five schools with an ETA, each of which sends a student to give a speech in English and present a talent related to a specific theme, which was “Message in a Bottle” this year. Each school held its own local competition to decide on a student representative in Jakarta. For SMAN 2 in Palangkaraya that student was Nabila Fatiha. When you meet Nabila, you will immediately notice her remarkable self-confidence. Many of my students, like high school students all over the world, struggle with self-confidence, but Nabila Fatiha does not. Furthermore, she has fantastic English language skills, and is smart, determined, and funny. She is the daughter of local business owners in Palangkaraya and has two brothers.Nabila is the president of OSIS, which is the American equivalent of class president, and she radiates leadership.Nabila’s eventual ambition, as of this article, is to work in international relations, and I have no doubt in my mind that she would be excel in this field. Before the local competition she sent me one text message asking if her topic was okay, but she sought no other help. Her speech was entitled “You are Beautiful,” and focused on appreciating inner beauty and how all people are beautiful. She delivered it using flawless English and then told a traditional story from Central Kalimantan about a princess who learned to appreciate true beauty through hardship. Although my local competition had over twenty contestants, all of whom gave compelling and good presentations, she won handily. After winning I helped correct a few minor grammatical errors and we added a few sentences, but otherwise she gave the same presentation in the national competition that she did at SMAN 2. When I passed on the suggestion from one of my local judges that she cut out a specific sentence, she demurred because she wanted to use her original text, which illustrates her well-placed high self-confidence perfectly. 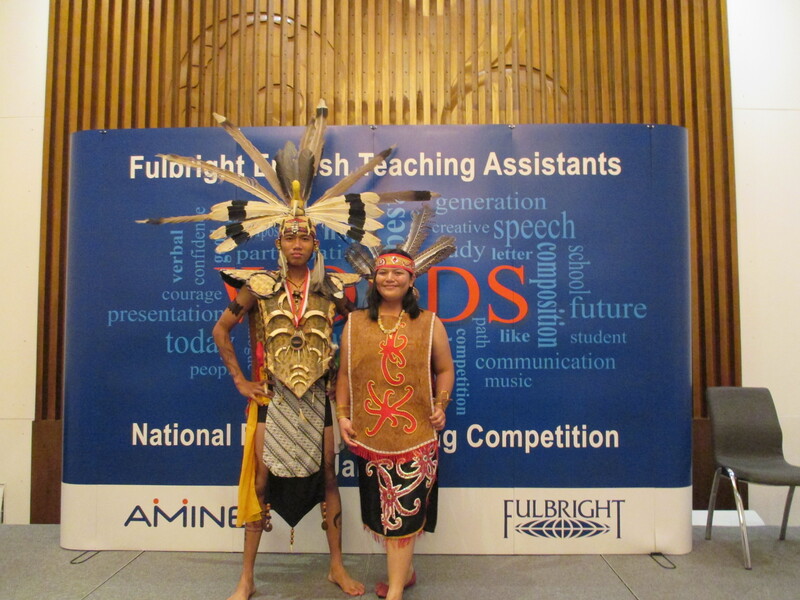 Leading up to the actual WORDS competition, we practiced together and Nabila selected a traditional Dayak[iii] costume to wear to the actual competition. On the day of our flight to Jakarta, she was cool and composed as always. Frankly, I was more anxious about the competition than Nabila and once the competition actually started it was nerve-wracking. Nabila Fatiha and Simon Taufik Hidayat post-competition. Like most ETAs, I thought my student should have won. The performance she gave at WORDS in front of a very large audience was the best I have ever seen her give, including previous practice rounds and the SMAN 2 competition. I congratulated her on her fantastic job and tried to explain the meaning of a “clutch performance.”[iv] I was and remain thoroughly impressed by Nabila’s and the rest of the students’ performances, which they had to deliver in a foreign language in front of a large audience and a panel of judges. Unfortunately, she did not win, but she had an excellent take post-competition that she “learnt something more than just winning; which was friendship…I made a lot of friends, who are among the finest and the most exuberant students from all parts of Indonesia and they were all unique, kind, passionate, confident, and they had a message to bring.” Nabila may only be in high school, but it was eye-opening to hear that she had such a good grasp of what the WORDS competition is truly about. The rest of the weekend consisted of a whirlwind of activities. We ate a variety of foods from all over the world, and also had the opportunity to play laser tag, go bowling, and ice-skating, which were all new activities for Nabila and most of the other Indonesian students. She proved to be an extraordinarily fast learner, who quickly became a much better laser tag player and ice-skater than me. My fondest memories from my time in Indonesia include us playing laser tag, watching Nabila master the art of ice-skating, and most of all her brilliant performance at the WORDS event in Jakarta. Nabila Fatiha and her ETA Christopher Linnan hanging out with Simon Taufik Hidayat and his ETA Emily Masters. Indonesia and Palangkaraya are places with a great deal of potential, which I saw firsthand during the WORDS weekend. Students like Nabila Fatiha are the key to Indonesia’s future success and frankly, I am honored that we got to share this weekend with these future leaders. As my Fulbright grant draws to a close my biggest takeaway is that Indonesia’s greatest asset, just like all other countries, is her people, especially the younger generation, who are eager to help her grow and develop. I remain anxious, yet excited, to see the wonderful things that this generation of Indonesian students will do, especially Nabila Fatiha, of whom I promise you have not heard the last of. [ii] At SMAN 2, like most Indonesian high schools, students typically take all the same classes together with thirty to thirty-five other students on a similar track, e.g. science, language, or social. Nabila is in eleventh grade and in the fourth class, thus XI-4. [iii] The Dayak people are the native people of Borneo. [iv] Not sure if I was able to successfully convey the meaning.